I would be remiss if I didn’t mention the tragic, unexpected passing of Anton Yelchin. If Green Room is any indication of what is to come, he was a huge talent with a bright future ahead of him. There is something very cliché about waking up in your van with your band mates in a cornfield in the middle of nowhere. Even more cliché is when you have to syphon gas from a car to get to your next gig. This could be the beginning of a lot of great rock drama movies; but in this case, it is the opening of the new suspense/thriller – classified as a horror movie, Green Room. The Ain't Rights are a punk rock band making its way through the Pacific Northwest in search of viable venues to play. When one of their stops doesn't pan out as well as they had hoped, the promoter offers them a consolation prize and gets them a job at a Portland area "skinhead" festival. The venue is a backwoods club covered in white Supremes' graffiti, and the audience is full of mostly angry young men just waiting to find a reason to be violent -- although I'm not exactly sure they need a reason. All goes well until one of the band members forgets their phone in the "green room" and guitarist Pat (Anton Yelchin; Star Trek) discovers a murder while trying to retrieve it. From that point on the band become prisoners in the club and one by one are themselves murdered to keep the secret safe. The only two left standing in the end are Pat and bystander Amber (Imogene Poots; Need for Speed) who was friends with the original murder victim and a witness to the friend's death. The cast is made up of a solid group of actors with Yelchin and Patrick Stewart (as Club Owner, Darcy) standing out amongst the others. I would be remiss if I didn't mention the tragic, unexpected passing of Anton Yelchin. If this film is any indication of what is to come, he was a huge talent with a bright future ahead of him. The cinematography is minimal as the majority of the shoot took place in one location. However, the Northwest rainy weather did lend itself to the prefect backdrop for a gloomy, sinister, horror film. This feeling is certainly accentuated by the quality on the 1080p high-definition video. Unfortunately, the audio mix on the Blu-ray was less than desirable as it was difficult to hear/understand some of the dialog. I believe this had more to do with the original audio recording, though, as opposed to when it was transferred to DTS-HD Master Audio 5.1 on the Blu-ray. I suspect it was probably just as bad if one had seen it in the theater. 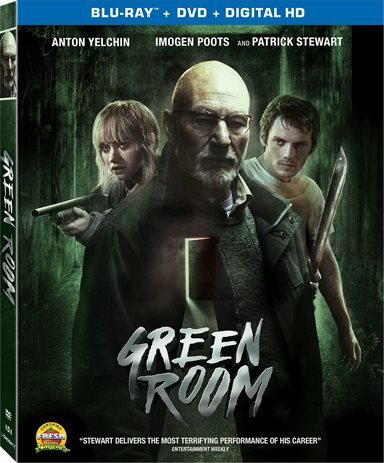 There are only two extras on the Blu-ray; the obligatory audio commentary with the Director and another feature called "into the Pit: Making Green Room". The latter gives some insight in to Writer/Director, Jeremy Saulnier's (Blue Ruin) vision and the challenges they faced while shooting the film. As horror movies go, this one is mild with some suspense but mostly playing on the gore factor. Without the same level of gore and perhaps a little more backstory, this could have been a completely different film fitting neatly into the Suspense/Thriller category instead. With a great cast and the gore factor, this movie is certainly entertaining; and based on the subject matter, I could see it becoming a cult classic especially among the skinhead set. Download Green Room from the iTunes Store in Digial HD. For more information about Green Room visit the FlickDirect Movie Database.